It’s always frustrating to see a game get so much right, only to fall flat on its face in a few significant ways, but such was my experience with Valkyria Chronicles. This game had been on my radar for a long time, and I picked it up a few months after its arrival on Steam. In most ways, it lived up to the hype, and I greatly enjoyed it, but its flaws are difficult to ignore. I’ll start with the good stuff since, like I said, this game does do a lot of things right. This is a strategy RPG unlike most others, one which ditches the isometric gridded maps for full 3D environments as in other modern console JRPGs. 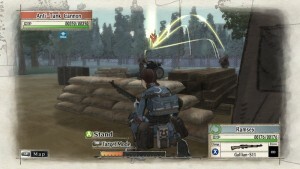 The gameplay is a mix of the real-time (shifting lines of sight and enemy fire while a unit moves) and the turn-based (everything else), with variables ranging from weapon capabilities to characters’ personalities affecting every action in the field. Keeping things simple, the character classes are limited to five (six if you include tanks), with the strengths and weaknesses of each clearly defined. The most welcome aspect of the battle system is the way experience is handled. One of the issues I almost always run up against in SRPGs is leveling up individual units; in these sorts of games, only those who deal the killing blows to enemies gain experience points. Valkyria Chronicles solves this problem by not doling out EXP until the end of a battle, after which it goes into a wallet of sorts that can be spent on leveling up entire classes and/or learning new orders, special buffs which can be used on one or more units during a fight. On the downside however, at least for me, the amounts of both EXP and money received at the end of battle are partially determined by a rigid grading system, where higher grades are given the faster a map is cleared, similar to modern Sonic games. Despite this, I found that the shared experience pool, along with the equipment upgrade system and party management options, nicely streamlines the most fiddly bits of a customization-heavy genre. The maps themselves are diverse in size, layout, terrain, and so on, and although the missions tend to rely too much on “occupy the enemy’s main base” as a goal, there is enough variation amongst the rest that this doesn’t become too dull. There is a learning curve for many of the missions, particularly if you’re like me and don’t want to lose any units (permadeath being very much A Thing for non-officer Valkyria Chronicles militiapeople), but the game is generally not very difficult. Aesthetically, there’s as much pleasure here as within the gameplay. The cel-shaded graphics have a earthy and sketchy watercolor look about them, and, despite the occasional bit of outlandishness in the character design, everything is animated with subtlety and grace. Fan favorite game composer Hitoshi Sakimoto is responsible for the soundtrack, which is slightly gentler and happier than some of his most famous SRPG works. Excellent voice acting and sound effects complete the package. All of this is presented within a nearly flawless PC port; I did encounter one very bad clipping error, along with one or two much less severe issues, but the vast majority of the game ran smoothly. Tying all this together is a user interface that is, for the most part, a dream to work with. 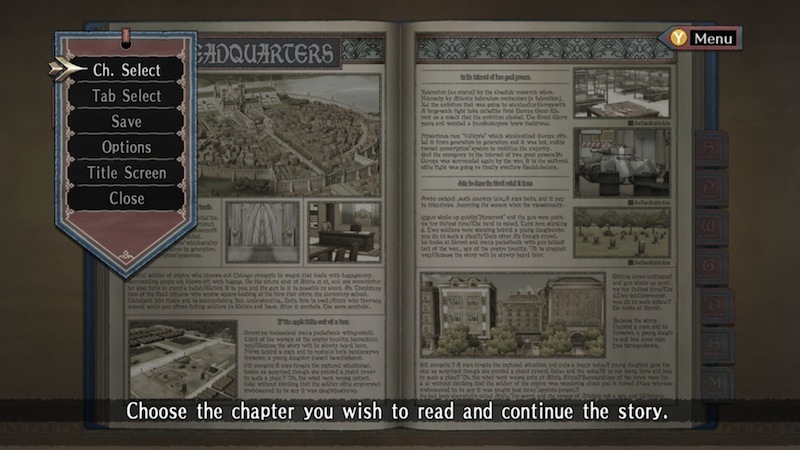 The main menu takes the form of a book, with story events and battles broken up into individual sections within their respective chapters. Every cutscene not tied to a battle can be replayed at the player’s leisure after they’re first viewed, making catching up on the story between play sessions a refreshingly trivial affair. Outside of the story, customization and other features are largely handled through a “Headquarters” tab, and similar appendices are available for optional skirmish battles, glossaries, and so on. Just about the only thing I don’t like about the main menu is that there’s no “Load” option; to jump to a different save file, one has to quit back to the opening screen and do it through there. In battle, the UI is just as handy, if not moreso. Things like number of remaining action points, unit locations, and so on are clearly marked, and although there are no takebacks after a unit has been chosen in the field, saving and loading files can be done at any time between actions. However, despite all the polish that has gone into how the game plays, the story has a handful of issues. 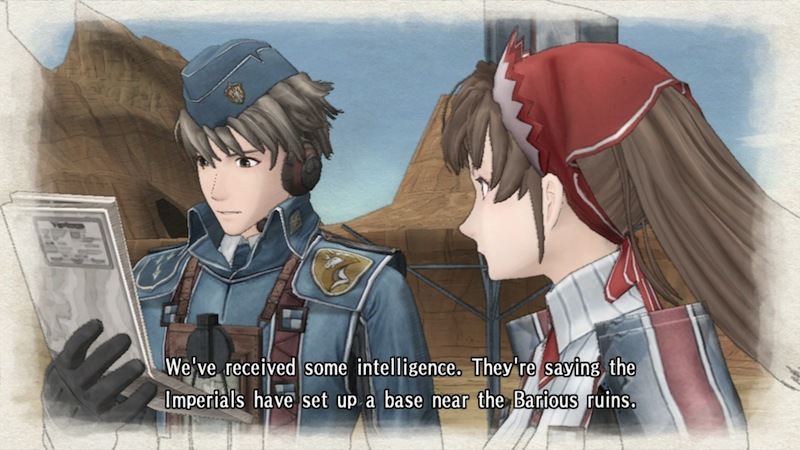 Blending the real-life inspiration of World War II with touches of JRPG-style fantasy, Valkyria Chronicles is set in the Europan country of Gallia, a neutral party caught between the western Federation and eastern Empire. 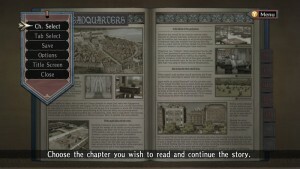 The story, presented in the form of a book titled “On the Gallian Front”, revolves around Militia Lieutenant Welkin Gunther and his comrades in Squad 7. 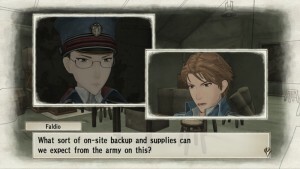 Naturally, Welkin just happens to be the son of a famous war hero, and has come to Gallia’s capital from a small town with two young women in tow: reserved younger sister Isara and energetic baker’s apprentice Alicia. If this one-guy-two-girls setup is reminiscent of Skies of Arcadia, that’s probably not an accident, as Valkyria Chronicles shares some key staff members, and even contains a few nice homages to the older RPG. However, the comparisons don’t stop there, as several of Arcadia‘s most conspicuous plot elements make themselves incredibly clear early on. Because Arcadia was lighter in tone and, to a certain extent, unabashedly cartoony—with brightly-colored graphics, a setting that could only exist in fantasy, and themes of adventure and discovery—it could largely get away with its by-the-numbers story. On the other hand, the more grounded Valkyria, with its more modest plot centered around a small country doing its best to defend itself, doesn’t have that luxury. As a result, and despite some surprises and high points, Valkyria‘s story is more obviously predictable than even your average JRPG (particularly if you pay attention to certain details in the opening movie) and its few missteps stand out all the more. The primary example I can give of the latter involves a major spoiler, so I won’t describe it in great detail, but I do want to discuss it, so I’ll try my best not to give too much away. It starts with a well-executed story sequence, and quite moving as well, so much so that it was the third instance of a game making me cry. However, even while this event was playing out, one character’s reaction to it confused me. More worryingly, when a certain aspect of this event is repeated later on, it felt like a cheapening of what had come before; on top of that, there was a ton of foreshadowing leading up to Event #2, so it’s not like that storytelling mechanic was all on the shoulders of Event #1. To the writers’ credit, Event #1 did have lasting relevance right on through to the end of the game, so it wasn’t a superfluous scene. However, the execution of both events was… poorly considered. This was, I might add, the point where I started to grow somewhat tired of the game. The characters, like the story, don’t shy away from cliches, and despite most of them being pleasant, or, at the very least, interesting to watch, there’s only as much depth added to them as needed for the plot. This is especially true of the non-story-required militia members, each one of whom can be neatly filed away according to archetype. Fortunately, there are a wide variety of recruits to choose from when forming your squad, and it’s easy enough to ignore the most annoying-seeming characters in favor of those who are more appealing. On a positive note, it’s hard to ignore the fact that these grunts are a step up from the bland, personality-lacking units of the SRPGs of the past. Choosing your squad, however, is not an option in the “Enter the Edy Detachment!” DLC, where you are stuck with six specific militia members, including and led by the shrill Edy, in a brief side-story where they get separated from the rest of Squad 7. This mission is unusually difficult if you don’t learn how to second-guess the AI, and doesn’t really add anything to the main story. Much better is the Selvaria-focused “Behind Her Blue Flame”, which shows a somewhat different side of this enemy general and includes some nice little tie-ins to the main game. There are two other DLCs, an unlockable “Expert Mode” for the main game’s optional battles and a set of Edy Detachment-themed skirmishes, but I didn’t touch either of them. All four come with the Steam release, no extra purchases necessary, which is a nice bonus. 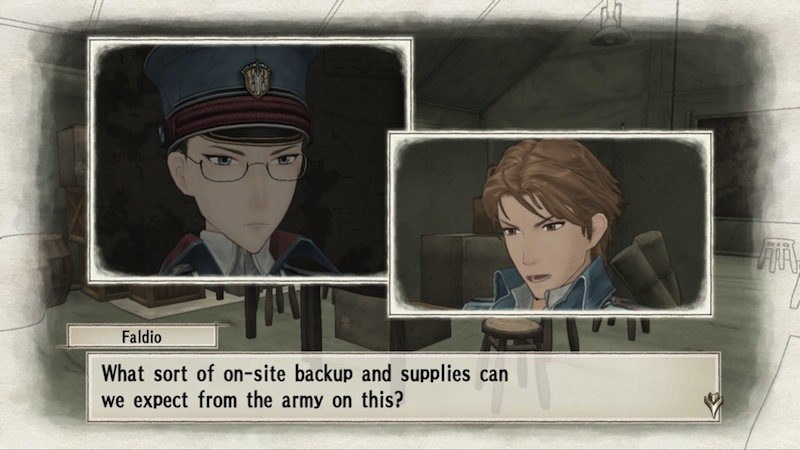 Even without these essentially-free DLCs, Valkyria Chronicles‘ PC port is solid package that’s worth picking up, but if you’re a newcomer, be warned that the story is neither as good nor as innovative as the rest of the game.